The air was blowing with a certain chill that gets to your bone that day, from the house where we were staying our gracious hosts took their day from work off just to take us around Los Angeles. 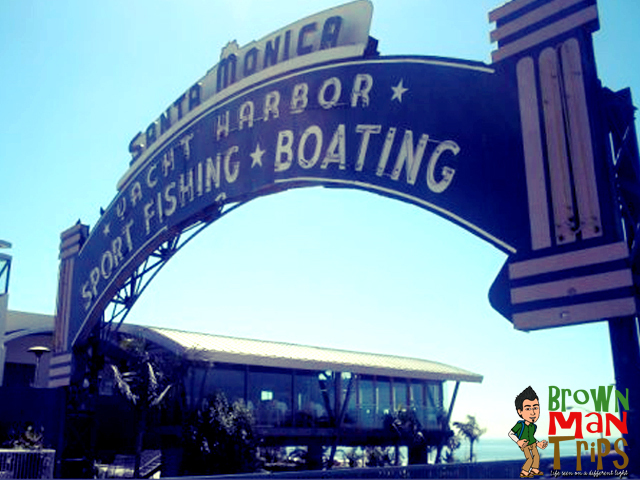 First stop for the day was the Santa Monica Pier which is one if not the oldest pier with an amusement park on a boardwalk. The Pier can be found at the crossroads of Colorado blvd. and the famous scenic Highway 1 more popularly known as Pacific Coast Highway. Faking a phone call home…. LOL! After walking around the beach it self we went back up again the board walk to the amusement park on it. It could have been nice to ride some of the attractions but we were too early and it was still close, I think it opens in the afternoon till late night, I am not sure I have to check on that one. The first thing that I noticed was the carousel, its actually a historic carousel built in the 1920’s this ride is considered as a permanent historic landmark in a landmark it self. Make sure to try out the binoculars on the pier where you could see Malibu and Venice beach which is just across the horizon of the pier. I will surely come back to this place one day and spend more time on the beach maybe visit it during the summer time, Oh boy! I need to start working out so I wont be shy taking my top off… hahaha…. but that’s gonna take a while though but I’ll make sure that I get that bod in time for my next California Summer Holiday!